Quick Reviews of 4 Books you may be interested in. Theo Ellsworth creates books that pivot and place you in spaces wildly psychotomimetic and yet deeply affecting. Drawn in mostly straight ballpoint pen, this 36-page black and white zine defies unloading in terms of narrative, and yet, as is typical of an Ellsworth book, seizes your attention, as if pleading with your subconscious to recognize limitless process as well as marking the path to some recognition of healing. As is also part and parcel of an Ellsworth book, there’s a tension towards resolution and an understanding of the importance of the unknowable self. Ellsworth provides guides to cosmic understanding. Thrill Mouth #1 sets the stage for something new, something important. As always, it is Ellsworth’s dense art that captures this perfectly. The draw of a Simon Moreton comic is his ability to reduce everything to its most basic elements and, in that, expose its emotional core. Like much of Moreton’s work, Minor Leagues Four is introspective, scrutinizing the past, breaking down that which was into those beats that linger, paring the entirety to gestures and capturing the lines that outline experience. Moreton seems to see summation as story, and his linework prunes the personal into universal tokens, allowing his readers to mirror encounters of their own existence, their self on top of his. 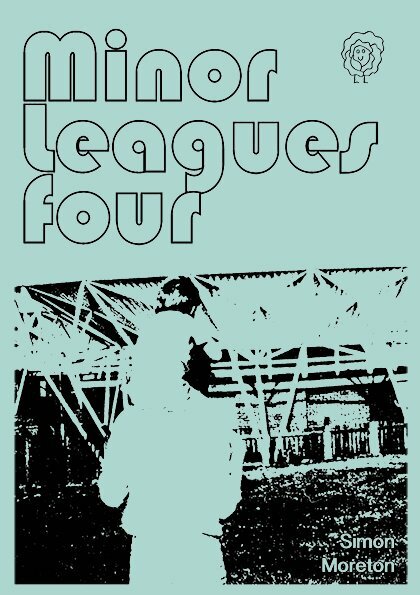 Cartooning combined with short fiction and photographs, Minor Leagues Four is both zine and rhetoric, and once again proves that Simon Moreton is an artist of and for our times. One of the best things about Zainab Akhtar’s quarterly curated ShortBox releases is she consistently introduces us to artists to whom we might not otherwise have access. French animator, designer, and artist Jonathan Djob Nkondo is one such creator. 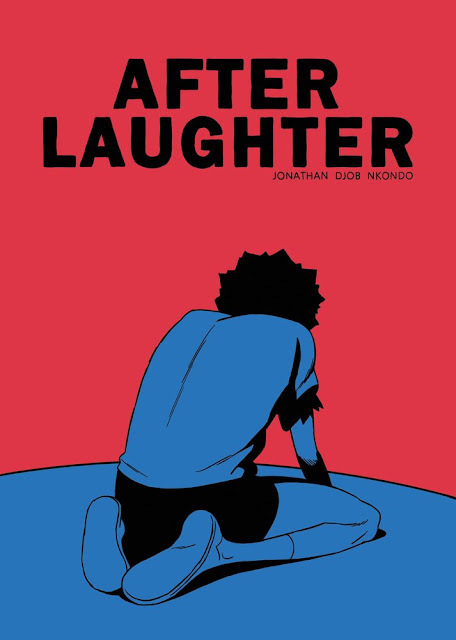 His book After Laughter is, perhaps, perfect. This wordless 44-page, black and white book reads as if it were a short film, reflecting movement and time, focusing attention and perspective in a manner not often found in comics. Parsing story into sequential static images, as Nkondo does here, makes that which could be a passive experience,the act of viewing an unfolding as told by another, into an active engagement -- the reader lingers as long as they feel necessary on panel or page, focusing on whatever element that draws, each creating cadence of an intrinsically personal reflection. Then, in that moment of closure only found in the experience of comics, the reader ends up having a unique interaction with the text, revealing in that, themselves. Nkondo’s use of negative and positive space adds to what he is seeking to convey. Here, solid truths, those of the agreed upon black and white variety, seem to fluctuate through the choices of the artist, and yet, even in this, an agreed upon reality is pushed to the forefront. This is an amazing book from an amazing talent, and it’s one that should be on the shelf of anyone who considers themselves a fan of the medium. In order to talk about Leda Zawacki’s Little Gods, it may be best to just quote from the solicitation from Tinto Press. It was “originally inspired by the Northwest Native American creation mythology Mount Shasta and the Grizzly Bears. Sky Gods closely follows the Native American myth and uses much of the original text. 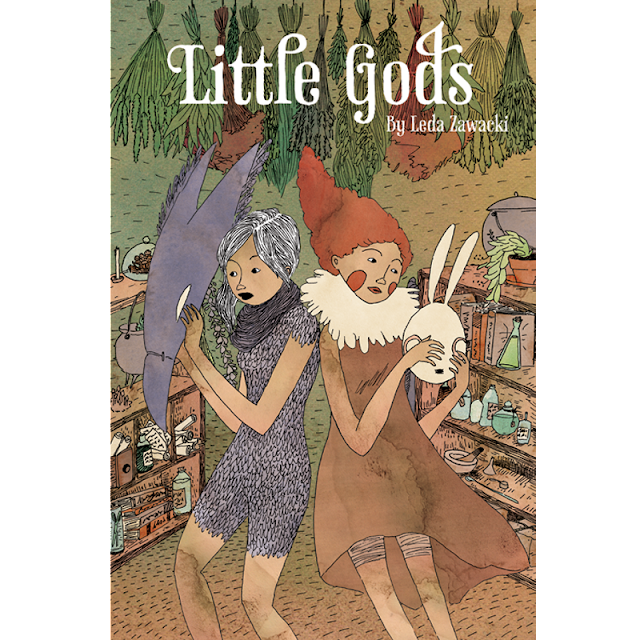 With Little Gods, the story is diverted into an alternate, female-focused mythology while embracing some of the main themes and symbolism from the original story.” Zawacki’s art in this book is beautiful, taking full advantage of possibilities watercolors offer cartoonists. As well, framing the story to focus on love, acceptance, and empowerment adds a further dimension to a rich mythology. This is gentle comic, one to be enjoyed and shared with those needing a voice, a community, and a sense of purpose.